I have wanted to blog this recipe for some time – it is one of the first things I tried from Bill’s Basics and it has since become one of our favourite curries. I have tried so many curry recipes over the years, most of which involve lists of ingredients as long as your arm and lots of toasting and grinding spices so I was rather intrigued by this recipe’s simplicity and to be honest a little suspicious that the end result would have enough depth of flavour thanks to the concise list of ingredients. 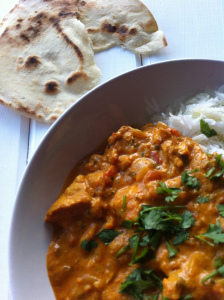 As it turns out this is a great little curry that is fresh and light and bursting with flavour but it isn’t overly fragrant or spicy and that makes it perfect for the whole family – it’s certainly one of my son’s favourites. It is also so quick to put together and the only thing that will take time is cooking – so once all of the ingredients go in the pot you can leave it on a low heat to blip away with the occasional stir to keep it from sticking. This is a perfect dish to prepare in the evening to be reheated for dinner the next day and it’s quite economical as apart from the spices, which you will get many dishes from once you buy them, there are only a handful of ingredients to buy. Bill’s recipe used lamb which of course needs a longer cooking time than chicken so although the meat will be cooked through sooner I do still give the curry one-and-a-half/two hours cooking as the as the sauce really does benefit from that time. This is also great made with chicken pieces on the bone. The original recipe doesn’t use garlic or coriander but I love both in curry. Put the chicken pieces in a bowl, add in the spices, salt, ginger and crushed garlic and toss together to coat the chicken well. Leave covered at room temperature for half an hour. Place a large heavy pan or casserole over medium-high heat and add the oil and butter and then the onions, stirring well to coat the onions. Cook until soft and translucent – for approximately 5 minutes. Add in the chicken pieces and cook for a further 5 minutes until lightly browned. Next add in the yoghurt – I tend to add a tablespoon at a time and stir it in so that it doesn’t curdle. Add in the water and the tin of tomatoes, stir well and bring to the boil for 5 minutes. Turn the heat down low and allow to simmer, stirring occasionaly to make sure it doesn’t stick or dry out too much – you want the sauce to thicken but not evaporate completely. Leave to cook for around an hour and a half and then add in the chopped coriander, lime juice and sugar, stir well and cook for a further 5/10 minutes. Check seasoning. Serve with rice and flatbreads. Leftovers: if there is any leftover (which doesn’t happen often here) this is great served cold in a pitta, wrap or bagel with some lettuce, mango chutney and a little mayo for lunch. This looks delicious! I LOVE a good curry but my OH is not so keen, so one that doesn’t blow your socks off is always a winner here. I’d been using a fairly tame Good Food one up to now but might have to give this a whirl, sounds like a good Saturday night recipe and I love the idea of taking the leftovers to work in pitta bread! Yum yum. I thought it was delicious! One of the first curries I’ve made from scratch that I will be cooking again. Ive had some very bad luck. Very flavourful without too much of one particular spice. Thanks!! Hi Jessica – thanks so much for the comment. I have had my share of disasters too and many that have had long time consuming methods and a million ingredients and it is so disheartening. That’s why I love this recipe so much – so very simple. Hi Jessica – thanks a mill for the suggestions – will give those a go as I am looking at healthier alternatives now too. Glad you like this recipe. This looks gorgeous and as I too am constantly trying out different curries, I think this one is definitely worth a go. Good tip to add the yogurt bit by bit too! Looking forward to trying it!